Rabbit IL-8 ELISA. 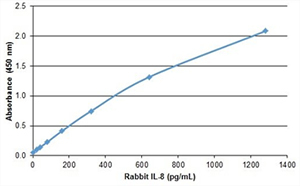 Recombinant rabbit interleukin-8 (PRABP006) detected using goat anti-rabbit interleukin-8 (AHP2992) as the capture reagent and goat anti-rabbit interleukin-8 conjugated to biotin (AHP2992B) as the detection reagent, followed by streptavidin conjugated to HRP. The rabbit immune response is modulated by interleukins, interferons, and chemokines. These cytokines modulate rabbit immunity, for instance, inflammation. Rabbit cytokine antibodies are used in ELISAs to, for example, measure Th1 and Th2 immune responses. 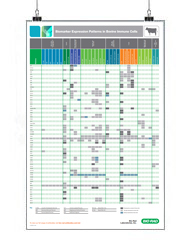 Bio-Rad supplies antibodies reactive to rabbit IL-1 alpha, IL-4, IL-8, IL-17A, MCP-1 and IP-10. These are validated for ELISA, with many rabbit cytokine antibodies also supporting western blotting. Bio-Rad can also provide the accompanying recombinant proteins for the anti-rabbit cytokine antibodies.